How good is the Velveteen Dream? This dude is special and everything he does is outstanding. I like EC3, but he hadn't been too interesting in NXT until coming up against the Dream. It's a tough match to call because I think Dream needs the win more, thanks to a poor TakeOver record, but EC3 hasn't felt like a major deal yet. I guess I'll say EC3, but Dream should win. This is gonna be good and it's still my least favorite match on the card. That's saying something about this show. Their Mae Young Classic Finals match good and I think this will be better. Kairi has the one win over Shayna so far and, while she'd make a fine champion, I don't think it's time to end Shayna's run. What a series. Screw whatever is happening in any other tag team division (most aren't any good in 2018). This has been spectacular. Their first two matches were awesome. The first gave us a feel good moment to cap a banger and the second was one of the best told stories in a tag match ever. As great as Mustache Mountain is, I get the sense Undisputed retains. They're around more consistently. This might be MOTN. Two guys who I thought were good, but nothing special during their runs on the indies. Since coming to NXT, Adam Cole has improved dramatically and has become a weekly highlight. Ricochet has also been great, so I'm excited for a match that wouldn't have given me that feeling a year ago. I'm going to say Ricochet wins. Their two matches have gotten ****3/4 and ***** from me. That's insane. The only combination of singles matches to get that across a six month stretch from me was Hart/Austin in 1996-1997. It's so hard to call this. 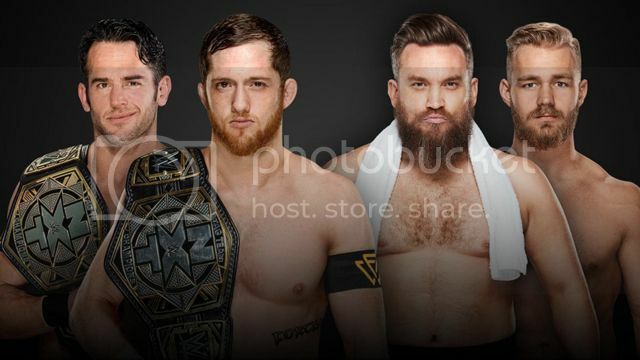 I've never seen Gargano as a long reigning champion (as great as he is, it doesn't really fit his character), so I just can't see Ciampa having a short reign before his. I also have trouble seeing Ciampa beating him again. It's tough. I'm going with Ciampa. It all comes down to this. After eighteen block shows, we’re left with Kota Ibushi against Hiroshi Tanahashi. Does Ibushi pull out the improbably or does the Ace get one final ride into the Tokyo Dome main event? With so many shows, I only focused on tournament matches leading up to this. Today, I cover it all. Post-match, Cody cut a promo saying Juice hadn’t improved and is just doing a bad impersonation of Kairi Sane. He held the US Title and said he’d be the next champion. Wrestle Kingdom 13 was announced and, as always, it falls on January 4th. After the match, Ishii made it clear that he wanted his shot at Omega. The champion seemed to accept. Kazuchika Okada and Roppongi 3K w/ Gedo vs. KUSHIDA, Pro Wrestler Sengoku Enbu, and Rey Mysterio Jr. I know some people were upset about Tanahashi’s win, but I don’t get that. Kota’s not under contract, so I couldn’t see him winning. Now, we get one of two things happening. 1) Tanahashi loses the briefcase. I suspect Jay White (who beat him) gets a shot and probably Okada (who went to a draw). It would be a way for Gedo to get Okada back in the title match without having him win a G1. And he’d get to do Tana/Okada again. He’d love it! Overall: 6.5/10. Most of that show was wildly average. The undercard has nothing you need to see other than the Ishii/Omega challenge and a bit of the LIDJ tag. You came here for the G1 Finals and that delivered in a big way. The excellent B Block has blown away what those chumps on the other side have done. Will the trend continue for them the way it did for the A Block on their final night? Like the A Block, only three guys are still in place. There are two matches on the line for that, while some others see a small feud reignited and a battle of champions. Also, shoutout to the B Block for drawing about double what the A Block did last night. Kenny Omega makes his third straight final with a win. Tetsuya Naito wins the block if he beats Sabre and Ibushi beats Omega. Kota Ibushi wins the block with a win and a Naito loss. It was announced that the Firign Squad left the building. It was better when we got that announcement about Tyler Breeze on NXT shows. In typical Gedo form, it all comes down to the main event. No way Naito was going to be allowed to be alive here. Ibushi wins the block, facnig Tanahashi in the finals tomorrow. Regardless of how that match turns out, I can’t put this G1 near the top of the ones I’ve seen. It was about half a stellar G1. The B Block was incredible, but the A Block (and Tama Tonga) truly held this back. The A Block was the worst block I’ve ever seen in a G1, with only one match getting ****+ from me. Off the top of my head, I’d probably go 24 > 27 > 26 > 28 > 23 > 25. Overall: 8.5/10. It started with a whimper thanks to Tama Tonga, but it picked up right after. Goto/Juice was strong and the final three matches were all fantastic. Ishii/SANADA was awesome, Naito/Sabre was a dramatic battle of two guys playing to their strengths, and the main event was outstanding. The B Block ended with the same kind of bang they opened with. Since I began watching the G1 Climax, the final set of shows was held in Ryogoku Kokugikan Sumo Hall. This year, we’re in Budokan Hall to wrap things up for each block. The lackluster A Block is coming to an end today. Only three members of the block are still alive, that being Jay White, and the obvious Hiroshi Tanahashi and Kazuchika Okada. Will the A Block tell a compelling story on their final night? Or will we get more of the same? White wins the block with a win and Tanahashi loss. Tanahashi wins the block with a win or draw. A loss knocks him out. Okada wins the block with a White loss and a win. Overall: 6/10. It was the A Block’s final opportunity to step up. They missed the mark and delivered more of the same. There was a sense of consistency from everyone. Some guys were solid (White, EVIL, Makabe, Page), some guys disappointed (Okada, Fale), some dudes were lame (HASHI), and one was strong (Tanahashi). In the end, this block was once again a massive letdown and it held back this G1 from being great. We’re almost to the end of the line, folks. It’s the final B Block show before we hit Budokan for the last three shows of the tournament. We’ve got one of the most anticipated matchups of the entire tournament, as LIDJ members collide when Tetsuya Naito meets SANADA. Kenny Omega, Naito, and Kota Ibushi are all still alive with potential to win the blocks. Kenny then got hit with a powerbomb. Kota’s hopes of winning the block are in danger. Page and Owens showed up with chairs to send the Firing Squad away. I usually ignore the show closing promo stuff, but this was special. EVIL and BUSHI showed up, with the former carrying Hiromu Takahashi’s ring jacket out. Naito put over LIDJ and when he got to Hiromu, the fans chanted for the Jr. Heavyweight Champion. Naito didn’t know when Hiromu would be back, but that he will at some point. The group all fist bumped to end things. Naito must defeat Sabre and have Ibushi/Omega end in a draw to win the block. Ibushi needs Naito to lose and to beat Omega to win the block. Kenny just needs to win since he holds the tiebreaker over Naito. Overall: 7.5/10. As we wrap up the pre-Budokan segment of the G1, the B Block ended on another high note. Tama Tonga wasn’t as bad as usual and everything else was at least good. The three guys you’d expect to be alive in the end are and I appreciated the creativity it took to set up Kenny’s loss. Naito and SANADA gave me the main event I wanted from them, Ishii/Juice was a blast, and Sabre/Goto was strong.